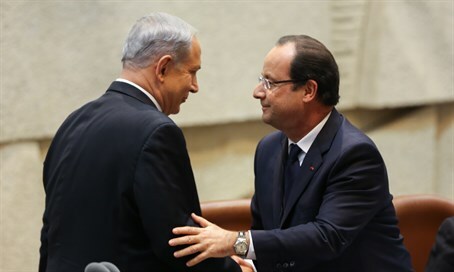 Netanyahu and Hollande agree to discuss fight against terror in meeting at upcoming climate conference in Paris. In the wake of a series of deadly terror attacks in Paris, Prime Minister Binyamin Netanyahu on Wednesday night telephoned French President Francois Hollande from the Knesset plenum. The Prime Minister expressed Israel's solidarity with France in the fight against terrorism. Netanyahu asserted that terrorism is a global problem and its solution lay in the cooperation of the international community. President Hollande thanked Netanyahu for his phone call, and the two leaders agreed to meet in Paris in ten days at the international climate conference. Earlier on Wednesday, Netanyahu offered condolences to Russian President Vladimir Putin over the terror-related crash of a Russian airliner in Sinai last month. Netanyahu and Putin also agreed to meet at the upcoming climate summit, to discuss the security situation in Syria in greater detail. Islamic State, which controls large swathes of territory in Syria and Iraq, has claimed responsibility for both the Russian airliner crash and the lethal attacks in the French capital.